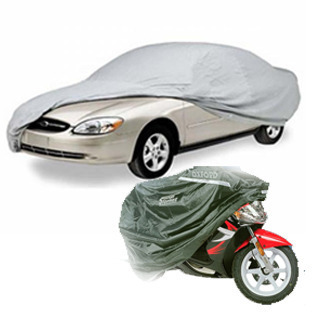 We offers tarpaulin Car & Bike Covers which are used to cover cars & Bike. These are made from standard fabric which enables its everlasting performance. These covers are water resistant and UV resistant. Our products are available in various dimensions to cover all types of car & Bike models. These have reinforced edges with metal eyelets which enhance it stretch and wear and tear capabilities. Incepted in the year 1968. We are one of the leading manufacturers, suppliers and dealers of an assortment of Tarpaulins, Cotton Canvas Plastic and Car & Scooter Covers. Our range encompasses Brick Covers, Poultry Curtains, Truck Tarpaulins, Fumigation Covers, Nylon Ropes, General Covers, Pond Liners and Elevation Covers. All our products find their applications in various industries such as paper processing, cement, construction, chemical, petrochemical and pharmaceutical. These are manufactured using quality raw material procured from the reliable vendors of the market to ensure longer service life as well as quality. Sayeed Brothers we have been successfully meeting the demands of our clients. All latest machines and equipment are installed at our unit that are required for smooth and accurate production process. Moreover, our team of expert professionals, which has years of experience, enables us to offer customization as per the requirements of our clients. Our wide distribution network also helps us to deliver our consignments at clients' end within the stipulated time frame.